Directions: From Linwood take 566 East into Green County 6.7 miles. Then turn right onto Scott Bend, for .5 miles On the right, there are only two stones about 35 feet from the road up an embankment. They stand about four to five feet tall and look like an oblisk with a cap on top. 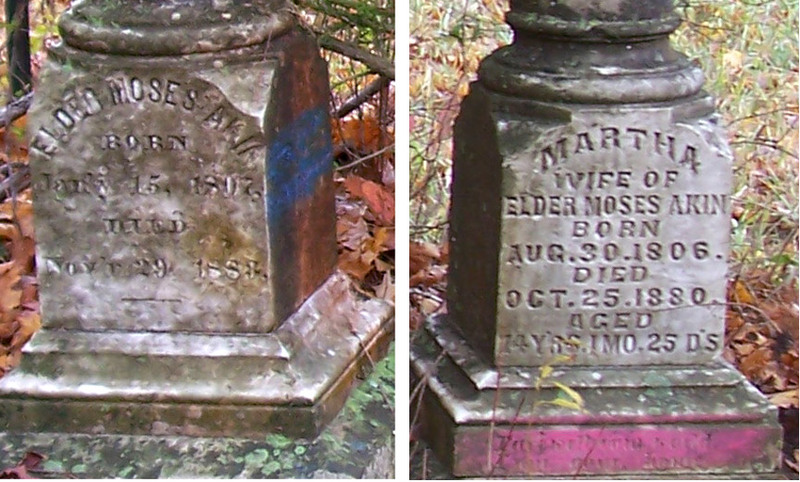 The burial site is located on the property of James Elmore in 2008. AKIN Elder Moses 15 Jan 1807 29 Nov 1883 Husband Stone Inscription: “In realms of bliss it never dies but knows a saviors love. While in this tomb our father lies, His spirit rests above.” s/o James and Mary (Murphy) Akin md Martha Patsy McCubbin on 15 Jan 1828. AKIN Martha Patsy McCubbin 30 Aug 1806 25 Oct 1880 w/o Elder Moses Akin d/o Nicholas and Elizabeth (Bloyd) Akin Stone Inscription: “Farewell vain world. I’m going home.” md. Elder Moses Akin on 15 Jan 1828. 1) Moses Akin was born in Lincoln County, Kentucky, and on 15 Jan 1828, married Martha Patsy McCubbin. Ordained in 1840, he was a Baptist minister, moonshiner and farmer and the son of James and Mary Murphy Akin. Moses Whitfield Akin, b. 25 Dec 1843. Was a Confederate Prisoner of War between 1861 and 1865 in the Civil War. His father came from Virginia. Moses was born in Green County, Kentucky in 1807, on the south side of Big Brush Creek, opposite the residence of Dr. Elijah Graham. He began preaching at the age of 30, having taught school several years before, but left the ministry for a while to “moonshine”. People, at that time, made their own family whiskey, with little thought of wrong doing. 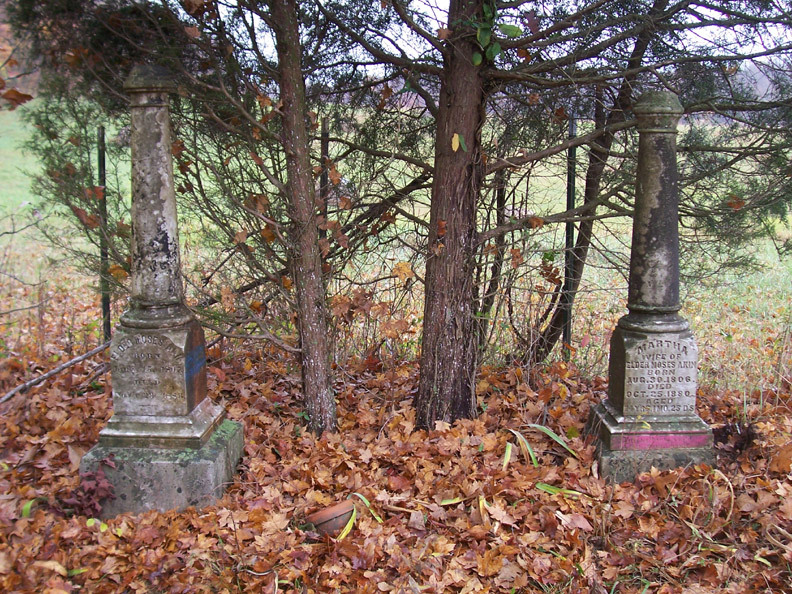 In 1845, he conducted a series of meetings at South Fork in Larue County and Three Forks Bacon Creek in Hart County near Hammonsville, assisted by Rev. Billie Brown of Virginia. He made trips in Western Kentucky and into Illinois and Tennessee preaching the gospel. At one time, he was pastor of the Baptist Church at Glasgow, where he once baptized 500 people during the close of one day’s revival meeting. It was during his seven years service at Glasgow that rumors became numerous (whether true or false) about he and his sister-in-law, Miss Lydia McCubbin. He was turned out of the church after quite a wrangle, but the church had paid him for his service by giving him a $7,000 farm. During the Civil War he was arrested as a southern sympathizer and sent to Camp Chase, Ohio. They were only trying two or three men a day, and some wouldn’t get out until the war was over at that rate until someone suggested “where two or three are gathered together in my name . . . whatsoever they ask it shall be granted”. Moses began a series of night meetings to which hundreds were drawn, and soon the authorities began trying about 40 men per day. When Moses was released, he returned to his home near Holly Grove and began farming and making moonshine. The revenuers pursued him, but he, weighing in at about 325 pounts, was soon overtaken. He lay down flat on the ground, and while the revenuers went for help to raise him, he fled. Moses owned two farms, the one near Holley Grove, where his sister-in-law lived with her two children, Christopher Columbus and Americus Vespucus, and the one on Green River, where he lived with his wife, and their ten children. He divided his time between the two farms. He held a meeting at Hammonsville at the same time one was being held at Boiling Springs, six miles away by the Baptist Association. His crowd was larger, and the Association meeting was nearly broken up by its members stealing away to listen to Moses. Shortly afterward, he left for Denizen, Texas, where a Green County colony had settled. He soon made several thousand dollars and came back through Missouri where he bought a farm and put Christopher Columbus Akin on it. Columbus later became a circuit judge and lawyer. He sold his Kentucky farm after his wife’s death, and prepared to move to Missouri. His last sermon was about Moses going up on the Mount to die. He took sick and was hauled to the McDougal farm in Larue County on his way home. He died at Holly Grove, and it was believed he had been poisoned.